By hungry runner on March 26th, 2010 . Filed under: Accessories, Electronics, Gifts . Budclicks are unique headphones that the creator designed when he noticed everyone wearing the same white headphones. 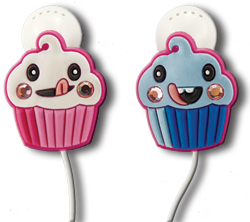 One of these individual and creative earbud style include cupcakes. The pair costs $9.95 with one ear a pink cupcake and the other blue, both are decorated with rhinestones, making them a fun gift for any cupcake lover young or old.